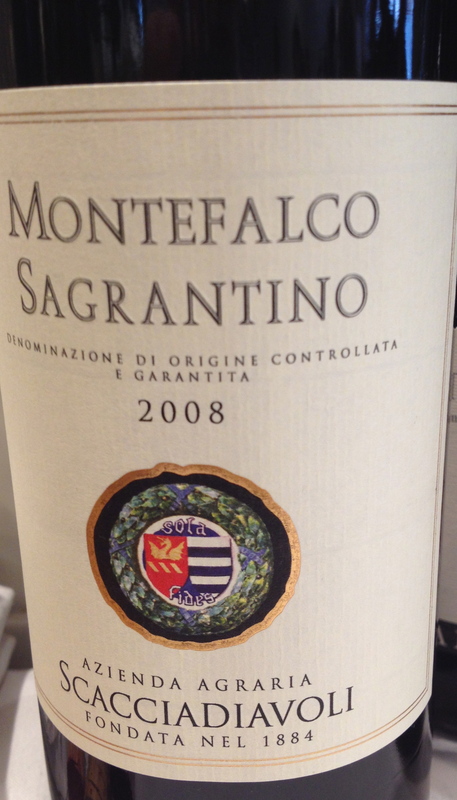 I have been a big fan of Sagrantino di Montefalco from the first time I visited the town of Montefalco a number of years ago. I knew the passito version of the wine, but that visit was the first time I was able to taste and drink the dry version of the wine from a number a different producers. Now I am a big fan of both. 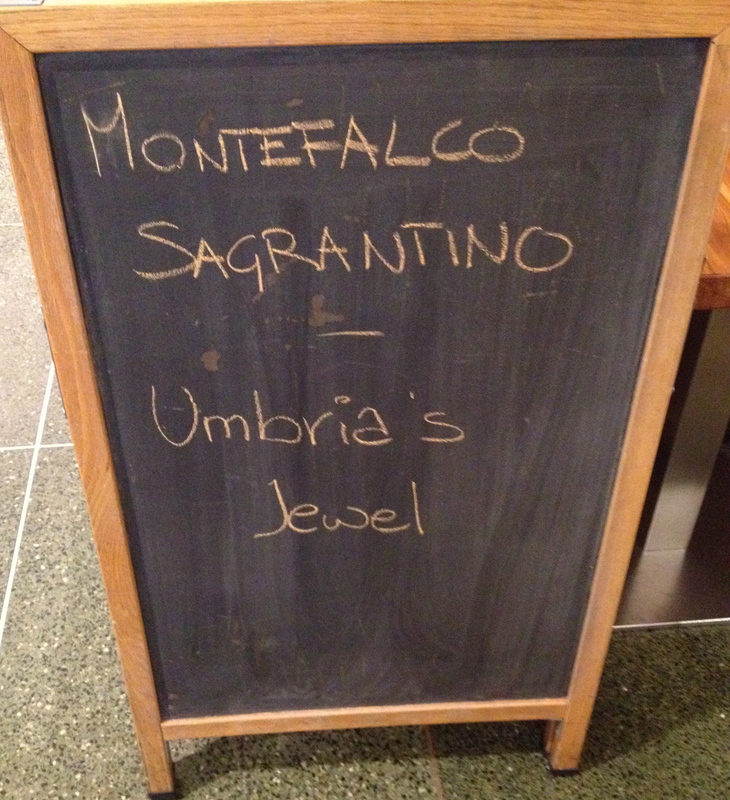 Eataly was the location of the 3rd annual Sagrantino Festival held in New York City earlier this month. The tasting included a number of producers that I had visited in Montefalco. This was an opportunity to to speak to them, taste the new vintages and find out the latest news from Montefalco. Marco Caprai from the Arnaldo Caprai winery, Filippo Antonelli from the Antonelli San Marco winery and Liu Pambuffetti from the Scacciadiavoli winery were in attendance. 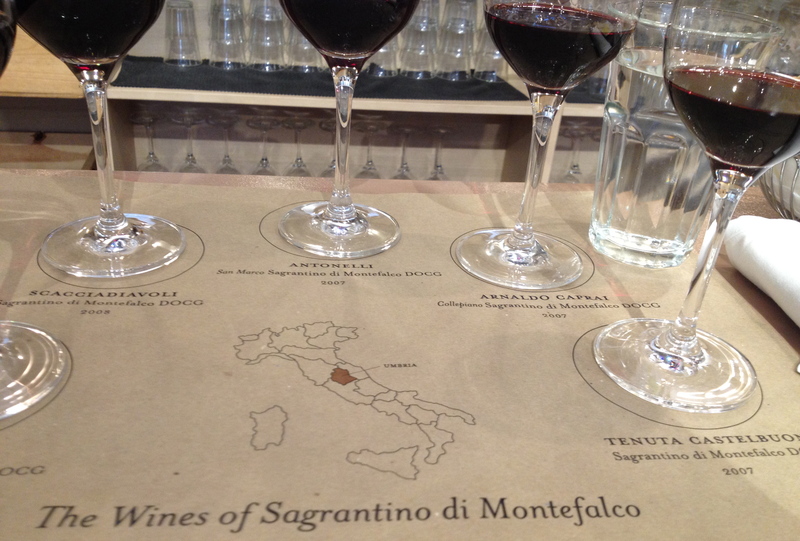 Sagrantino is indigenous to the hills of Montefalco and the surrounding area in the region of Umbria. It has no relationship with any other known grape variety cultivated in central Italy. It is believed that the name comes from the early cultivation of the grape by monks for sacramental wine and its use by local farmers especially during religious feasts and festivals. Sagrantino Passito has been produced for many centuries but the dry version has only been on the market for about 30 years. Today there are 74 producers of Montefalco Sagrantino and the production zone is five times its original size (122 hectares to 660 hectares). 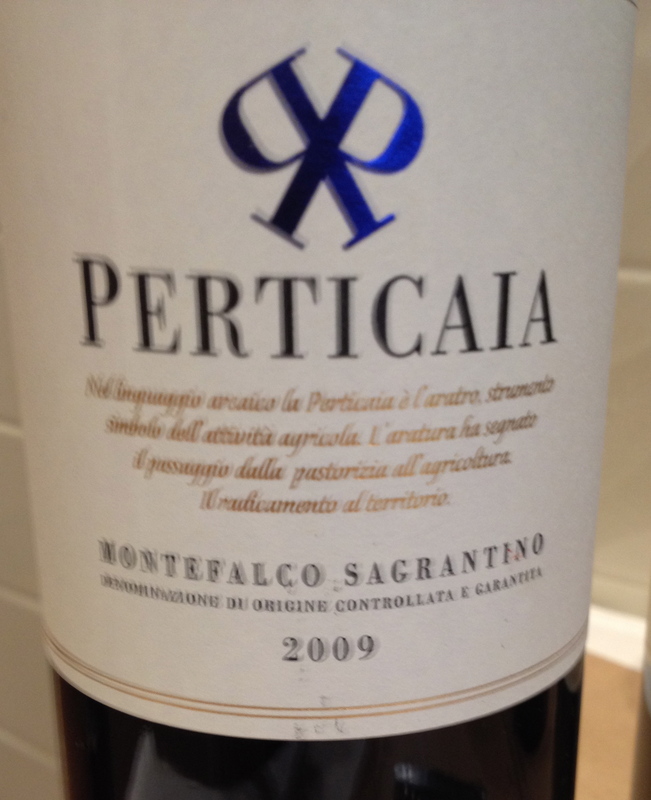 Sagrantino di Montfalco DOCG 2009 Particaia The harvest takes place the in the middle of October. There is a long maceration of at least 3 weeks. Aging of the wine is in small wooden barrels of French oak-barriques or tonneaux once the malolactic fermentation is completed. The wine is aged for a total of 36 months: 12 months in small oak barrels, 12 months in steel(this was the only wine aged is steel) vats and 12 months in the bottle. This was the only wine aged in steel vats. It was the lightest of the wines with soft sweet tannins and a hint of vanilla. Sagrantino di Montefalco DOCG 2008 Scacciadiavoli The means drive away devils) Harvesting takes place from the middle to the end of October. Vinification takes place for 3 or 4 weeks in French oak vats and the temperature is controlled. Aging is for 16 months 1/3 in 30 HL casks and 2/3 in French barriques and in bottle for a minimum of 9 months. This is a complex, elegant wine with intense fruit, hints of red fruit, plums, spice and a touch of herbs and leather. Liu said that they always had the same clone in the vineyard. Sagrantino is a dark and tannic wine. Liu spoke about tannin management and how this was done in the vineyard and the winery. She said that every vintage is different and therefore the tannins will be different. In order to get a balanced wine, the grapes must be picked at the right moment and maceration is according to the vintage. She said that they have a m selection- only one clone in the vineyard. Sagrantino di Montefalco DOCG 2007 Antonelli San Marco. The grapes are hand picked the first week of October and there is a final selection in the cellar. Vinification involves using the force of gravity because there are two levels in the cellar. During fermentation the skin is in contact with the juice for 20/30 days and then malolactic fermentation takes place. The wine clarifies spontaneously and there is no need for filtration. The wine is aged in toasted French oak barrels for 6 months and in larger oak barrels for 18 months. 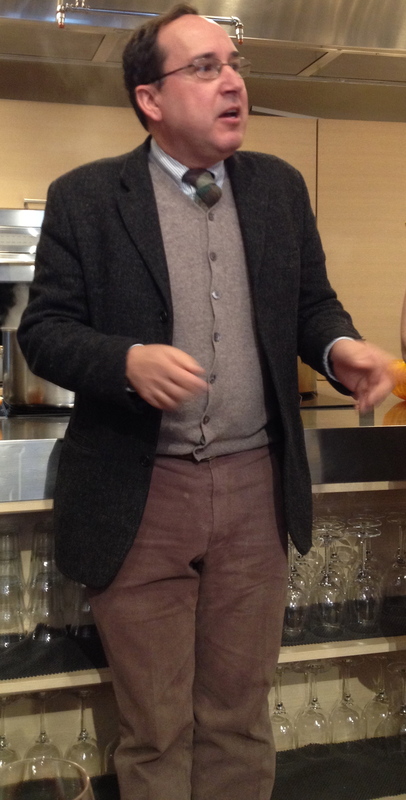 Filippo Antonelli said that they use to use chestnut woods for the barrels buy it gave to much tannin to the wine. Now they use oak from France and Germany. The wine settles in fiberglass lined cement vats for six months and another 12 months in bottle before release. The winery is certified organic. This is a rich, complex wine with hints of blackberry, cherry and citrus. Filippo said that because of the nature of the Sagrantino grape( high phenolics and anthocyanins and tannin) this wine could age for 20/30 years. When I visited Marco at the winery a few years ago I tasted a 1985 Sagrantino which was over 25 years old and was drinking very well. I also tasted a 1985 Sagrantino passito, which was also drinking very well. Marco added that the people in Montefalco are divided on when passito should be drunk at Easter — either with the lamb for dinner or with the traditional Umbrian dessert Ciaramicola. Filippo said that 2007 and 2009 were warm vintages and in these years the wine has citrus aromas and hints of oranges and pineapple. He told us that he wished Sagrantino month could be in February because St Valentino came from Umbria and the Sagrantino passito is a great combination with chocolate. 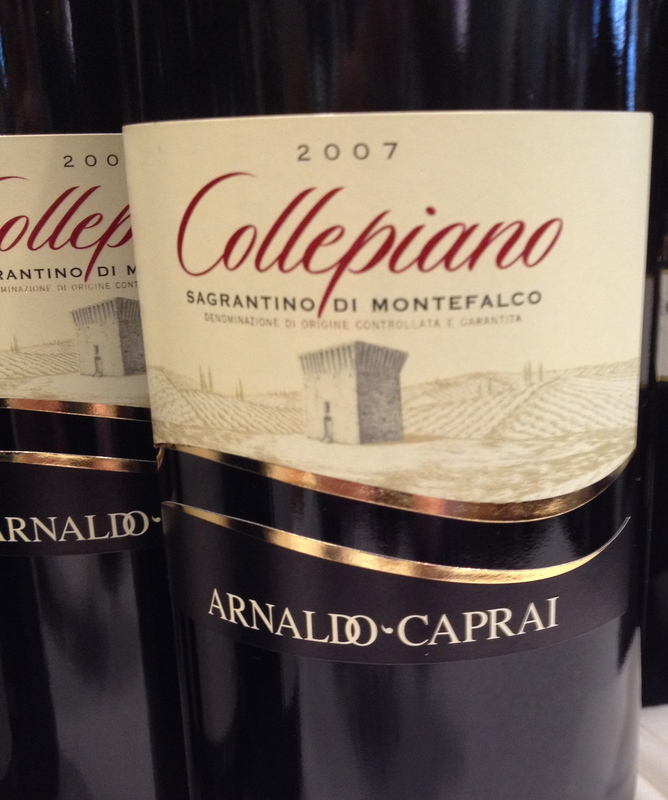 Montefalco Sagrantino Collepiano DOCG 2007 Arnaldo Caprai. Harvest takes place the last days of September and the first week of October. After a general crushing-destemming process, there is constant pumping over performed, as Marco said, to draw color and tannins from the skins. Maceration lasts for 30 days. The wine is aged in French oak for 22 months and in bottle for at least 6 months. The wine is big, yet elegant with hints of jam, clove and a touch of vanilla. This wine seemed much less modern in style than the ones I had tasted in the past. I asked Marco if they were doing something different and he said “NO”. 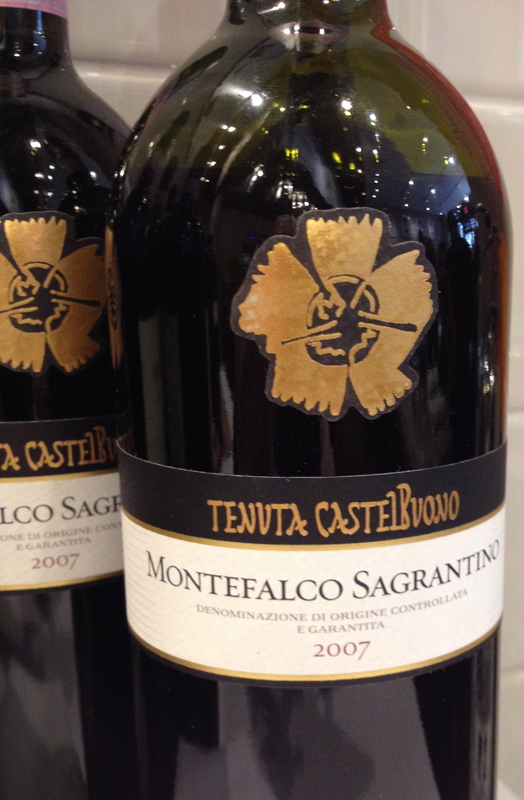 Sagrantino di Montefalco DOCG 2007 Tenuta di Castebuono. Hand picking of the grapes in October. The soil is muddy clay with a good agronomic potential and resistant to summer aridity. There is cold pre-maceration for 30 hours in wooden barrels. The wine is aged for 12 months in tonneaux and for 16 months in large barrels. The wine has hints of blackberry and blueberry with touches of cherry and leather. 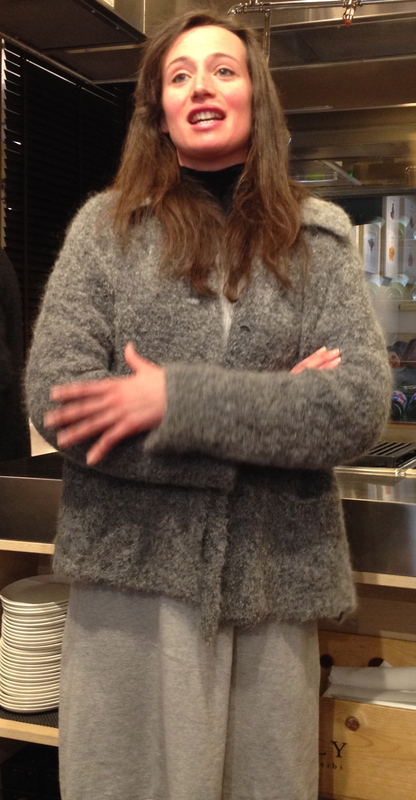 When I spoke to Liu from Scacciadiavoli, she told me something interesting. She said that their vineyard originally belonged to Alberigo Boncompagni Ludovisi. I was amazed the same owner of Fiorano used to own their vineyard-I wonder if he practiced the same viticulture there as he did at Fiorano. It seems I can’t get away from the Fiorano curse. Charles: Excellent post. These are complex, beautiful wines, aren’t they? We had the same event in Chicago and I was honored to lead the seminar. I think it’s important that we spread the word about the distinctive wines.